Bayliss announced on Tuesday that he will stand down as England coach when his contract expires in September 2019. This article was originally published before England's recent 4-0 Ashes defeat in Australia. 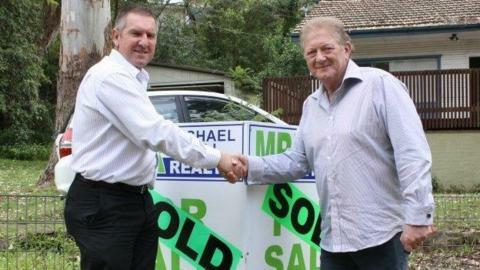 Not long after England last won the Ashes in Australia, Trevor Bayliss was working as an estate agent. Deciding to leave his post with Sri Lanka after he led them to the 2011 World Cup final, he applied for his old job as New South Wales coach and was overlooked. Unemployed, he was invited to try his hand at selling houses in Penrith, west of Sydney, by family friend Michael Ball. "He's not a silly man, but he had to go and do courses to be licensed to buy and sell houses," Ball tells BBC Sport. "He was very successful because he is a people person. The beauty is that the clients wouldn't have had a clue who he was. It wasn't until afterwards that they knew. "I still have clients now, who dealt with Trevor, asking if he's the England cricket coach." By working in Penrith, the suburb at the foot of the Blue Mountains that he still calls home, Bayliss was back in the community he first encountered in 1982. A talented young batsman, he moved from rural Goulburn at the age of 19 to test himself in Sydney's notoriously tough grade cricket system. His ties to Penrith Panthers Cricket Club run deep. He is their all-time record run-scorer and their annual batting award bears his name. In the year that Bayliss found himself out of professional cricket, Penrith's annual report read: "This season saw the return of one of Penrith's favourite sons, Trevor Bayliss, back closer to the club as first-grade coach. Glad you're back, Trevor." In his early days at Penrith, Bayliss lived with club president Bill Ball, sharing a room with fellow batsman Brian Wood. "We shared a tiny little room with about two feet between the bed, so we had to get on," says Wood. "He was a bloody good cricketer and a good leader. We copped a lot of sledging because we had baby faces and were very young. "Geoff Lawson (the fast bowler who played 46 Tests for Australia) said to him 'we're playing Green Shield today', Green Shield being the under-16 competition. "On another day, Lenny Pascoe (14 Tests) was bouncing the crap out of us and Trevor kept hitting him out of the ground. Lenny sledged him more and Trevor kept hitting him further, without saying anything back. "He had the mental capacity to weather a storm and come out the other side. By golly, he had the intestinal fortitude that made you know he was not backing down. He was mentally tough, a hard man. "We used to get a few bob off the Penrith club for how many runs we got. When we hit a four, we used to say to each other 'cash, cash, cash'." It was while living in Penrith that Bayliss met future wife Julie, with Wood a groomsman at the wedding in Goulburn. "I was there the day that she walked into the Ball household," says Wood. "We both stood there and our jaws dropped. "She said it was Trevor's tight, bright yellow tennis shorts that did it for her. "He got married wearing a pink jacket, which would have been trendy back then. "He had a mini cricket bat in the pocket. He reached inside during his speech and told everyone that he had his bat with him." Bayliss would have an eight-year first-class career with New South Wales, but his coaching teeth were not cut in the sunshine of Sydney. His first taste of a job that would lead to international recognition came in Glasgow. As part of a two-year spell as the overseas player at West of Scotland CC, Bayliss was asked to coach at the High School of Glasgow by West captain Colin Mair. "He was only in his mid-20s and his first coaching role was working at the school in the summer of 1989," says Mair. "When he finished playing, the first professional coaching job he got was a development role with New South Wales. I was one of the few people who had actually seen him coach, so I wrote him a reference. "He loves Scotland and has stayed here a few times since he got the England job. Even before then, when he was here with Sri Lanka for the 2009 World Twenty20, I had him back coaching the kids at the school and the cricket club." By the time he took charge of Sri Lanka in 2007, Bayliss had been introduced to Paul Farbrace through a coaching exchange between New South Wales and Kent, suggested by former Australia captain Steve Waugh. "I went to Sydney for a month and spent some time with Trev," says Farbrace, now the England assistant coach. "I went to his house one evening and Julie cooked for us. At the end of the week I came home and didn't hear from him again for 18 months. "Out of the blue, I got a text from him asking if I would become his assistant in Sri Lanka. "When I joined him out there, he met me at the Taj Hotel in Colombo. We had two-year contracts, but the first thing he said to me was, 'I'm not sure I'll last two weeks here'. "About 18 months later, I asked why he picked me for the job. I'd only spent a week with him in Sydney and we barely knew each other. "So it was nothing to do with my coaching skills? 'Nah,' he said." Bayliss was in the running to be England coach in 2014, when Peter Moores was appointed. When Bayliss eventually arrived in 2015, it began a reign where he has given away precious little about himself. Seldom seen without his trademark floppy hat and sunglasses - they have prescription lenses - his public image is a man of few words, fewer gestures and nothing approaching histrionics. If one of the hopes of speaking to those who know Bayliss best was to reveal a different side to his character, it has been dashed. "Calm", "down to earth", "a man of few words" and "no frills" have been repeated again and again. That is not a criticism. It simply reiterates the point that, with Bayliss, what you see really is what you get. "He's exactly how he appears to be," says England fast bowler James Anderson. "He doesn't give much away. He's not the most talkative guy in the world and, because he's like that, when he speaks, people listen. "He's different to anyone I've been coached by before. He's created a really relaxed environment and that's important because, when you're in the dressing room, you don't want any added pressure." The hands-off approach, a contrasting style to that of predecessors Moores and Andy Flower, was initially welcomed, especially when the Ashes were regained in his first series in charge in 2015. However, though England's white-ball teams have been on a steady upward curve of improvement, the stagnation of the Test side has led to some questions of Bayliss' methods. Overall, the Australian's record in 33 Tests at the helm is 15 wins and 14 losses, with four draws. You could make a convincing case that a side including Alastair Cook, Joe Root, Ben Stokes, Jonny Bairstow, Moeen Ali, Stuart Broad and Anderson should be producing better results. Familiar problems remain. Holes at two, three and five in the batting line-up are no closer to being filled and too many catches are dropped. Are England able to take wickets when the bowlers have little or no assistance to work with? How far away is the next batting collapse? How successful is the selection policy? Of the 13 players given a Test debut by Bayliss, only Toby Roland-Jones has come close to establishing himself in the Test side, with Bayliss regularly admitting that he has not seen hopefuls play in the County Championship. After a 340-run loss to South Africa at Trent Bridge last summer, George Dobell of Cricinfo wrote: "It does rather beg the question: what does he do? If he's just creating a relaxed environment, he could be replaced by a couple of scented candles, a yucca plant and a CD of ambient whale noises." Bayliss read that to Farbrace over breakfast the following morning. "He thought it was a good line," says Farbrace. "He found it quite funny. "No one should be fooled by the fact that he appears to sit and do nothing. That's not how he operates. He does his best work one-to-one and can speak clearly to the team when he needs to. "He does sit back and let people do their jobs. What people outside don't see is that he does know what's going on." And so to Australia, where Bayliss returns home with his country's oldest cricketing enemy, attempting to defend the most storied prize in the game. Even before England travelled without Stokes, their task looked a stiff one. In their past 35 Tests down under, England have lost 24 and won only six. Although they are on track to perform well in the home World Cup of 2019, England teams are usually judged on their Ashes performances. Nothing prompts introspection and sweeping change quite like a miserable tour of Australia. In his own backyard, Bayliss will be scrutinised like never before. Still, according to those closest to him, Bayliss will not alter. "Water off a duck's back," according to Anderson. This past summer, Bayliss was joined in England by his son Adam, who played club cricket for Stratford-upon-Avon. On his days off, Bayliss Sr was often seen wandering around the boundary, following the all-rounder's progress. "He came to watch eight or nine games," says Stratford captain Mike Brown. "If he was available, he'd follow us home and away. "We were keen not to hassle him, to just make him feel like any other parent. These, after all, were his days off. "Because of that, I didn't really go to him for advice, but one day, after we had a pretty hefty defeat, he put his hand on my shoulder and said, 'As I say to our lads, at least you'll still be alive in the morning'." It is advice Bayliss may need in the weeks to come.